Rummage for Reading is Back!! Are you ready to rummage? If so, stop by the Library and check out the Rummage for Reading table. Normally we don't set it up until early Spring, but this winter we've had so many items donated that we decided to start early. Already this week a picnic basket, a large silver mixing bowl, a 4 qt. casserole dish, and a ceramic frog have found new homes with lucky shoppers. How do we get the items? People doing spring cleaning bring them in. Or perhaps they've had a rummage sale and donate the leftovers. One family is moving their mother from her home to an assisted living site and they are donating lots of items. 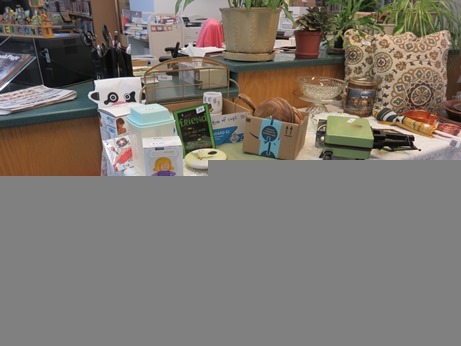 Families benefit by having a place to donate items to, and the library benefits from selling those items. It's a win/win scenario! So if you're itching for your first rummage sale of the year, stop by the library and take a look at the Rummage for Reading table. Talking of rummage and Spring, we are planning our next Spring Fling. It will be held on Saturday, April 13th from 9am to 1pm. We still have some tables available to rent. The cost is $25.00. To reserve one you can call the library at 920-394-3281 or stop in and pick your spot. The library will again be serving coffee and homemade cinnamon rolls in the morning, along with loaded baked potatoes later in the day. Other plans are in the works, so watch for future news!